I am not afraid of the “hard work” it takes when working toward a goal. Attaining goals would be a whole lot easier and more pleasant without struggles. But since life itself is inherent with built in struggles that is unrealistic. 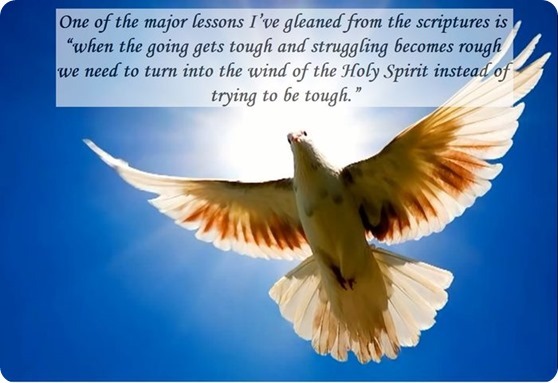 One of the major lessons I’ve gleaned from the scriptures is “when the going gets tough and struggling becomes rough we need to turn into the wind of the Holy Spirit instead of trying to be tough.” Experience has taught me by struggling into the wind of the Holy Spirit my weakness becomes the very thing needed to push me onward even though the circumstances remain. According to Paul the goal he is “running and struggling” for is the “prize of being called to heaven” however is it really Paul’s goal? When we read “This is the prize that God offers,” could it be the ownership of the goal becomes twofold, both Paul’s and God’s goal at the same time? While I may be stretching it a bit I am going to believe the goal Paul and yours truly are running and struggling for has joint ownership. And I see my own personal struggling comes not from life (although there are many that I face) but from turning into the wind of the Holy Spirit as it pushes me onward to where God wants me to be. Anticipate it! Experience it! Believe it! Be transformed by it!